Singer 4423 Heavy Duty Extra-High Sewing Speed Sewing Machine is a perfect entry level sewing machine. It is not a fully computerized rather an electric sewing machine. But, it has many incredible features that make this sewing machine an incredible one. This is famous for its awesome sewing speed. It is very user friendly so that you can easily cope up with this sewing machine within an hour from buying it. So, it can be a good choice for your day to day life sewing. Bobbin with clear view cover. Fully automatic 1, 1-step buttonhole. Stitch can be selected by a dial. Free motion sewing with drop feed technology. Singer 4423 has many advantages of its own. The first thing to point out is its price. This is a great sewing machine which comes with many features. But, the price of this sewing machine is affordable. And this sewing machine can sew 1100 stitches per minute, which is incredible and way too faster than any other standard sewing machines. You can get a great service from this sewing machine. This sewing machine is a true performer. It has a metallic internal body which makes this machine good for heavy duty sewing. You can easily accomplish your day to day sewing works with this machine. And also, any beginner can get used to this machine so easily. It is very easy to operate and so that the beginners will not get any problem sewing with it. The professionals will also feel so comfortable to operate this sewing machine. 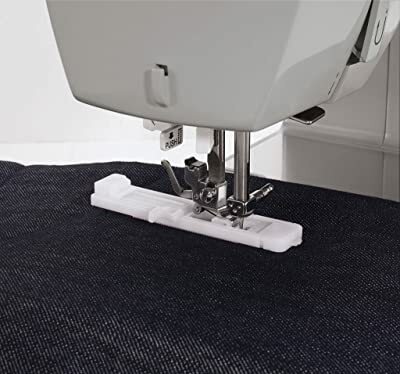 So, if you want a sewing a machine which is a great performer as well as easy to use, but within an affordable budget, then this is the one for you. To get the best out of your sewing machine, you have to take extra care of your sewing machine. There are few things you can do. While you are not using your singer 4423, cover it with any hard cover to keep it clean. Never forget to disconnect your sewing machine from the wall socket after completing your work. During making any adjustment to it, stop the sewing machine. Remember to never pull threads so hard at the time of sewing, needles can be broken. Change your needle plate if broken. Do not put anything on the openings of your singer 4423. Always keep your sewing machine dirt free. Never spray any inflammable chemicals near your sewing machine. Always use the perfect wall socket for the specific sewing machine that has the perfect voltage amount. Clean the hook and feed dogs area regularly. Oil your sewing machine, but don’t use normal oil. Use sewing machine oil. Open up the packaging and bring out the Singer 4423 Heavy Duty Extra. Take the power/ foot pedal electric cord. Connect one end of the cord to the power jack of your machine. And connect the other end to the wall socket. Turn ON your sewing machine. Take a bundle of thread. And put it onto the spool pin. Take the bobbin out of the accessory storage. Put the bobbin on the bobbin winder and push it to the left. Pull certain amount of thread from the thread bundle on spool pin. And wrap it around the thread winder. Place the thread inside one of the bobbin holes. And pull it to extend the thread to hold on to the thread. Re-push the bobbin winder to the right side. By using the hand wheel, start winding the bobbin. Once your bobbin is full, just cut the thread. Then put the bobbin in the bobbin case. Then start threading the needle. You can easily do that by an automatic needle threading system. Follow the illustration on the machine’s body and that will be done. After that you can optionally adjust the tension of your sewing machine. This sewing machine offers many implausible features. It might be an entry-level sewing machine from Singer but it can give so much of a great performance. With its great speed of sewing 1100 stitches per minute and firm metallic internal body, it can perform to a huge extent. Additionally, it has a user-friendly using interface, which will make your everyday life sewing smoother than ever. So, if you are a beginner or even a professional at sewing, this can be the next sewing machine of your own.